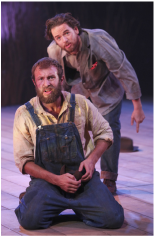 Benjamin Dilloway, left, and Michael Legge as Lennie and George in Of Mice and Men. Picture by Ellie Kurttz. JOHN Steinbeck wrote the iconic novel version of this story at the same time as he created its stage interpretation. In fact, there’s some debate as to which form gave him the greatest inspiration. What’s clear, however, is that he had a burning tale to tell of the devastating effects of America’s Great Depression in the 1930s. Roxana Silbert’s new production at the Rep makes much of the wide-open Midwestern skies, the relentless poverty of the scenery and its inhabitants, and the almost wilful disregard for the value of life. In Liz Ascroft’s dusty, expansive design, it’s a featureless, heartless wilderness in which the human tragedies are played out as meaningless insignificances. The central performances are terrific. Michael Legge is believable, empathetic and impressive as George, the migrant ranch hand looking for work in the Dust Bowl. Benjamin Dilloway is even more heartrending as his not-quite-there travelling companion Lennie, all clumsy-featured and childishly provokable. The pair make a touching, moving combination, and the fact that we’re never quite sure why George keeps the liability Lennie with him only adds to the poignancy. The supporting cast are also strong, with standouts from James Hayes as the broken old-timer Candy and Dave Fishley as the outcast black worker Crooks. But it’s the bond between George and Lennie, and the inevitability of the unfolding tragedy that gives the story its power. Some evocative sound and music (Nick Powell) and judicious lighting (Simon Bond) add atmosphere, and if the production never really hits you in the gut like the original story must have done for Steinbeck’s American audience, it’s not for want of trying. RUDY’S Rare Records began life as a half-hour Radio 4 comedy programme and has made the transition to stage courtesy of its author Danny Robins and its star Lenny Henry. But, like the Jamaican granddad of the title, there’s no disguising its roots, and this show, running at nearly three hours, amounts to a heavily extended sitcom episode. The good news is, it’s high-quality sitcom. 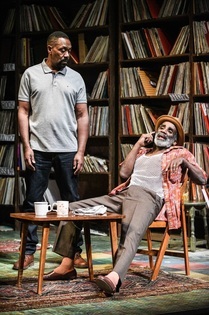 The jokes comes relentlessly fast, they’re mostly very funny – when you can penetrate the thick Caribbean accents of some of the characters – and there are some three-dimensional, believable characters who people the old-fashioned vinyl emporium that is threatened with demolition. Lenny himself plays returning prodigal son Adam, back to look after his failing-hearted father Rudy and the shop where he grew up. The twist is that Adam himself is a dad, determined not to replay with his own son the prickly relationship he’s experienced with Rudy. The three generations are touchingly played by Lenny, Joivan Wade as uni student Richie and veteran comedy actor Larrington Walker as the grumpy old man with a veritable casino of chips on his shoulder. A live band, ostensibly rehearsing in the back room of the record shop, provides some tidy backing for a reggae soundtrack throughout, as well as affording Lenny the opportunity to indulge in some trademark character comedy work. It’s not what you’d call theatre with a message – there’s a minor rant about Amazon and iTunes and some schmaltzy stuff about fatherhood – but it’s a fun, fast-paced evening of unashamed entertainment and toe-tapping tunes. Birmingham certainly seemed to like it a lot. The Hackney Empire, where it was co-produced and to where it transfers, will unquestionably adore it. IT’S the centenary of Dylan Thomas’s birth and as a result you can hardly turn round without running into umpteen celebrations of the famous Welsh reprobate and his work. Clwyd Theatr Cymru, perhaps better qualified than many others to mark the anniversary, have dusted off his 60-year-old masterpiece Under Milk Wood and given it a fresh outing for this commemorative tour. But before the naysayers start up with their talk of jumping on the bandwagon or cashing in, let it be noted that this Welsh actor-led production from the Mold company’s artistic director Terry Hands not only has a fine authentic pedigree, but it also does the business. Written as a play for voices, Under Milk Wood has proved challenging for theatre directors ever since it was first created. And then, of course, there’s the definitive recording for BBC radio featuring the extraordinary narration of Richard Burton, all set to leave mantraps for anyone daring to follow in its wake. Hands makes a delightful virtue out of the lack of stagecraft in the text. He sets it on a beautifully constructed disc of sandy light courtesy of designer Martin Bainbridge, with a matching disc suspended as a backdrop and displaying a birds’ eye view of Llareggub town and its environs in miniature. Against this plain but effective canvas, he paints a succession of vivid images with a multi-faceted cast of eleven who people the town, flitting dexterously between Thomas’s colourful characters and generating tableaux and vignettes of intense emotion, whether it be touching pathos or rip-roaring laughter. Each incarnation is carefully drawn and portrayed to give a lively, evocative picture of the townscape without ever succumbing to caricature. At the heart of everything stands Owen Teale in the Burton role of First Voice. His mellifluous tones, beautifully judged intonation and comic timing are immaculate, and the depth and breadth of his range as he narrates the passing of a single day in this bizarre backwater is a breathtaking achievement. The real winner – apart from the audience – is Thomas’s language and poetry, which is given full rein by the whole company in spite of some tricky acoustics in the Rep’s cavernous auditorium. There are shades of magic, mayhem and a very evident love of the sheer boisterousness of the words. In short, it’s a bit of a gem and a valued contribution to the worthy honouring of a Welsh giant. CONSIDERING his pop and musical theatre pedigree, a straight play packed with dense ideological arguments and set in a grimy basement kitchen may not seem like natural territory for David Essex. But then, not much about The Dishwashers is as you expect. This European premiere showcases the work of Canadian playwright Morris Panych, who has constructed an extraordinary play – for the most part a three-hander – out of less than promising raw material. A young man starts a new job in the cellar of a classy restaurant, where he is mentored by an old hand and a much older hand in the art of washing dishes. Panych’s master stroke is to take this seemingly drab premise and craft its dialogue and unravelling narrative into a firework display of wit, ideas and sparkling brilliance. In the hands of director Nikolai Foster, the play is never allowed to stand still. With a stunning, uncompromising design by Matthew Wright and some clever lighting from David Plater, the piece has filmic qualities that are heightened by the insistent, threatening score of Grant Olding’s incidental music. But it’s much more than a philosophical riff on the meaning of life or the apparent futility of menial work. Foster draws out from his small, hard-working cast a whole array of nuances that tap into pathos, drama and high emotion, not to mention a relentless succession of big laughs. At the heart of this merry-go-round of intersecting ideas stands David Essex as Dressler, a thirty-year veteran of the subterranean battleground. At first he seems inscrutable, obscure and unknowable as new boy Emmett learns the ropes. But there’s always a hint of a twinkle in the eye, and as the second act cranks up the temperature, Essex allows more and more of Dressler’s humanity to emerge, with devastating effect. Rik Makarem’s Emmett starts out brash and supercilious, but as his back story seeps out, so his manner subtly evolves in a performance of meticulous care. Andrew Jarvis, meanwhile, threatens to steal the show as Moss, who has been in this underground cavern “since the dawn of the Dishwashing Age” and whose sickly pallor suggests he hasn’t seen the outside world for most of that time. Jarvis’s chain-smoking, breathless, batty old man is no pantomime figure, however, and provides much of the sadness alongside much of the comedy. These three thrust and parry as the play goes on, constantly shifting position and allegiances until a single dramatic event halts them in their tracks and throws a new perspective on all their lives. It’s another of Panych’s coups that the production handles brilliantly, and Birmingham Rep should be proud to be launching this fine, entertaining and thought-provoking piece of theatre.